I finally put all my Halloween decor away (it was hard to do--I love Halloween!). Now I'm scrambling for some cute fall stuff, since everything I have is packed away in a storage unit! 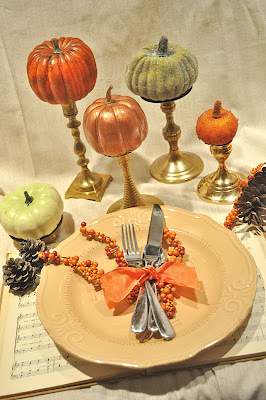 I do have a couple of projects in the works, but for today here's a quick and easy way to dress up inexpensive pumpkins to use in lots of ways, like in a fall centerpiece. I used Martha Stewart's Liquid Guilding in copper (thanks to a nice contribution of her new stuff by Plaid). It is way cool stuff. I can't wait to guild a few ornaments for my handmade Christmas, too! You can see the full tutorial for how to guild objects over at Make and Takes where we're guest posting today. Enjoy! 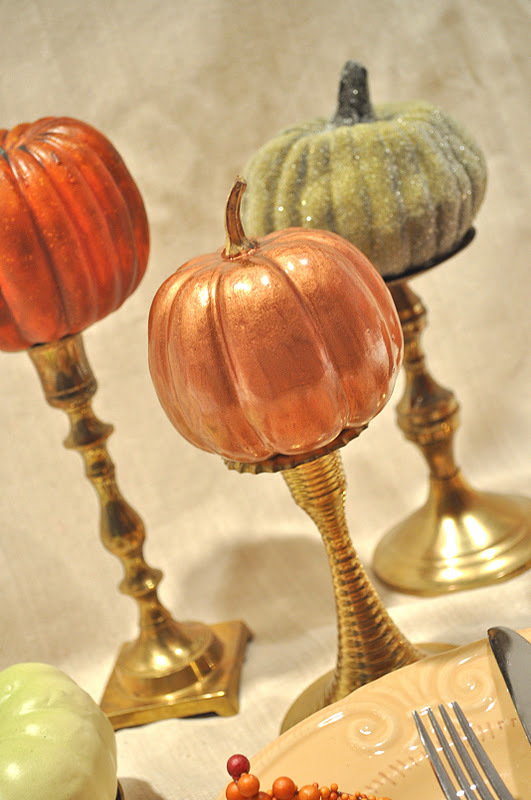 The copper pumpkin is gorgeous!!! I'll have to look for that paint next time I'm out and about. They look beautiful--yes, I agree, the copper one IS gorgeous! And, fyi everyone--I just saw that Michaels has their fall/Halloween items 80% off! Maybe they'll have some mini-pumpkins? I'm with Tina and Cheree. The copper pumpkin is beautiful. (O.k, I really wanted to say GORGEOUS). For some reason Billy Crystal just popped into my head. LOVE the pumpkins!! I'm a sucker for pumpkins and those are just gorgeous!